Thanks Phoenix! I originally intended to make the floor and fences have a completely different palette to the background, but that didn't work out too well because of the walls (dithering) and one of the restrictions (16x16 squares with the same palette). I wasn't planning on editing Belmont's sprite, but you're right. There is light at the end of the tunnel. I dig your color choices, Night. The dither half-tone gives the wall a texture of wallpaper, and it the tears (with the exposed brick) add a good amount of visual variance without using too many tile resources. By the way, it appears like you added a panther statue to the scene? The panthers in the original screenshot are enemies, so it makes for an interesting interpretation. 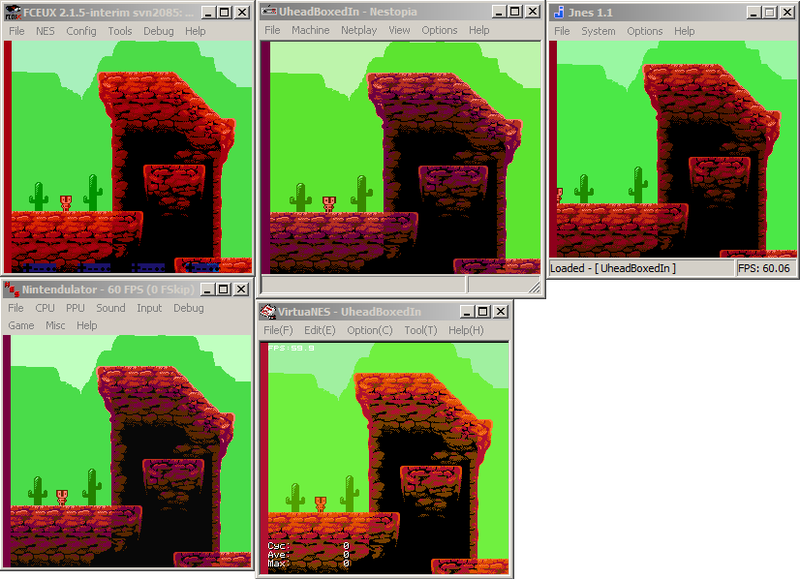 Phoenix: Palettes... are not something I think I know enough about to give really good info on. I recommend an NTSC Palette over a PAL one because that's what the Japanese developers of this game had in mind. I recommend that specific palette generator because it was made by trying to recreate how the colors are generated by the hardware in software rather than say... looking at my specific TV and trying to match colors by eye. There's a lot of weird stuff that changes how the signal is generated. There's a thing where a color will appear different based on what it's next to. What appears to be brown on top, and orange on the front face are the same color. (Ignoring jpg compression.) Paint one on top of the other to see. Except on NES, the actual color can change depending on what it's next to, and not just how it appears. So any "eyeballed" palette is basically gonna be wrong. I think that's... as far as I can get into it without really getting into things I can't explain. tl;dr: There simply isn't a way to get an exact RGB triplet for any color in the NES palette. Bisqwit's the is one I use to make graphics for my actual NES games I run on my actual TV. There's also Drag's which similarly tries to replicate how the hardware generates color in software. Either one is fine. It's just there are a lot of "NES Palettes" on the internet that aren't that at all, and I'd prefer people don't use them. It is 72x80, rather than 80x80. I personally don't worry about that for my own games, but it's interesting. The exact same rom, using the exact same NES palette indices on different emulators. Look how different they are! None of them match my TV, and none of them will match your TV. 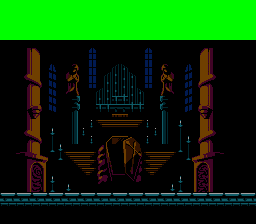 If I recall correctly, Nestopia gets the closest as far as its default palette. Edit: If anyone wants to try to get their graphics in the actual game, I recommend Stake. You may need to use it in tandem with something like YY-CHR to make actual tile changes, but maybe not. I haven't fully explored Stake, but it seems to be far better than all other choices I found. A few people have asked, and I personally have zero interest in putting any of these graphics in the actual game. 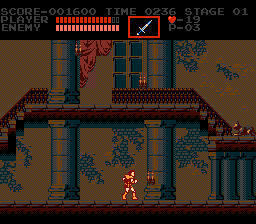 I'm working on a thing like Castlevania from scratch right now, and displaying any graphics in something new like that would actually be less trouble if you ask me. But I don't really intend to even do that. Maybe if something really speaks to me. Was pretty fun! Not sure if I've done it all correctly though. Careful with that dithering. It creates a less than ideal wave effect. I think some occasional noise clusters might work better than the constant dither. Really love that brown/blue combo though. Thanks for talking about palettes. Studying screenshots with 16px grid in Photoshop on I've envountered another questionable area. Look how tiles are 50% displaced from the grid. Also we have those 8px tall black bars on top and bottom. What are they? Can we use them? I figured it has something to do with a thing called "overscan". While NES PPU generates a 256x240 picture, most TVs display area about 256x224. Like resolution of screenshots in this thread. I guess the main question is if we can put tiles there. And also how to correctly check it for 16px regions? Just forget about all that and move it for 8 pixels to align with the grid? I would guess it has something to do with this. So vertically scrolled half an attribute cell to prevent stuff being cut off on some TVs? Some emulators hide some lines by default, but I always turn that off. I'm of the opinion all mockups should be 256x240. The NES has no information about the TV, as a developer you have no guarantee your consumer's TV will hide any lines. But you similarly have no guarantee the TV won't hide lines, so you still have to plan to not put important information on the edges in case the TV does hide some. TV Shows usually do the same thing. They don't put text very near the borders. we have those 8px tall black bars on top and bottom. What are they? Can we use them? This decision was probably based on the fact that the game doesn't scroll vertically and the fact that some lines may not be displayed. 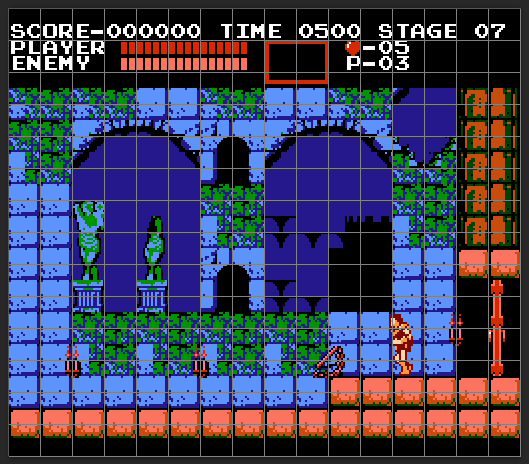 The game's levels are built out of 32x32 structures. There's only 16 pixels below the zero tiles. Moving the HUD up to allow another full row of 32x32 structures would ensure the top of the HUD wouldn't be seen on most TVs. Doing that would also have probably made the level data take up more space (an extra row to store information about after all), so it's a reasonable choice. I guess the main question is if we can put tiles there. 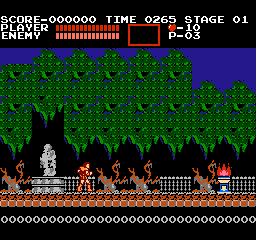 So yes on NES, no in Castlevania. And also how to correctly check it for 16px regions? Just forget about all that and move it for 8 pixels to align with the grid? This is going to sound like a sarcastic answer to the question, but I promise it's not. 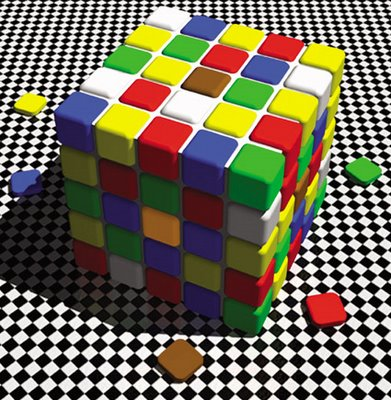 If you can put the grid anywhere on the image and create no problems, well, that's where the grid would be. If you put the grid someplace where there are problems but there is a place where the grid could not cause problems why would you put the grid where it causes problems? NES scrolls in hardware. If you had a screen that was problematic with the grid starting at the top left corner of the screen, you'd absolutely offset it in a way that would make your graphics work. One caveat: The 16x16 grid must always start at the top left of an 8x8 tile. On the left are the tiles stored in hardware. The 16x16 grid starts at the top left of this. Where the gray line is represents where the topleft of the screen is. You can think of this map as infinitely repeating. If the gray line is very close to the right of the screen, it will start rendering from the right of the map, and loop to the left when it reaches the end. You can start displaying from any part of the map, so the 16x16 grid can technically start anywhere on the screen. In theory it has 4 screens of tiles, but in practice two of them are usually "mirrored". Games that scroll horizontally tend to have the left two and right two be different. Games that scroll vertically tend to have the top two and bottom two be different. Game that scroll in both directions... tend to have to make sacrifices. That's probably offtopic. Slightly more on topic. I did try to hack some of these mockups into the actual game, but the engine is more restrictive than I thought. It can still probably be done, but my attempt was time consuming enough with no playable result that I don't think I'll try again. I did do something else which I'm probably not going to post, but you can look forward to a PM on that front, Phoenix849! Hello! First post in the forum, I hope I'm not breaking any rules. Also, thanks to Phoenix849's input, I also fixed some issues that had escaped me. So, kudos to him there. Thank you! Indeed, I think I could have even added a few extra tiles using the grey to create the look of indentations that don't go as far as to reveal the bricks behind them. Haha, I wasn't aware it was an enemy. I noticed that a few things in the scene used the same colour palette; being the candles, curtains and the panther. So I thought, with the first two behind inanimate, the panther is probably inanimate too and as such a sculpture. Huh. I'll keep that in mind in case I work on another one. I would agree if it weren't for the fact I'm using the NES palette provided by Kasumi; noise clusters work quite well when they aren't too far apart from each other value wise, which isn't the case with said palette (if I were to create random patches with the grey and orange, it would look somewhat bad I reckon). However, there is a pretty big problem with using dithering as an extra tone the way I did with the limitations given, as it eats away at two colours in a palette (out of 4) whenever an object that isn't a block is needed, like the staircase railing for example. I was basically sacrificing an extra colour in favor of depth, I feel. Hi. I was going through the nes restrictions posted here and in the linked post and I'm not clear if we get four palettes for background tiles and four paletttes for sprites, for a total of eight usable palettes or if it is only four palettes in total that need to be distributed amongst background tiles and sprites. If anyone can help clarify or point me to a source that does, I'd appreciate it. Thanks in advanced.